If you’re looking for social skills activities for kids with autism, as well as practical tips to help you teach social skills to a child on the autism spectrum, you’ve come to the right place! While no two children with autism are the same, and the range and intensity of symptoms varies from person to person, social dysfunction tends to stand out the most when interacting with a child on the autism spectrum. Some kids find back-and-forth dialogue difficult, preferring to talk only about a topic he or she is interested in, while others prefer to avoid social interactions completely. To an outsider, it often seems as though these children prefer to play independently, and while that may be the case for some, many kids with autism genuinely want to form friendships with their peers. In the face of communication challenges, sensory processing sensitivities, an inability to express their own emotions and understand the emotions of others, and problems with impulse control and self-regulation, the world is an overwhelming and confusing place for people with autism, and despite their best intentions, they often fall short when it comes to reading social cues and responding appropriately. The good news is that it IS possible to teach social skills to kids with autism, and we have 25 tips and social skills activities to help. Be a good role model. One of the foundations of teaching social skills for autism is to model what appropriate socialization looks like for your child, and explain what you’re doing and why. This can be uncomfortable for parents and caregivers who are introverted, but when you model consistent and positive social behavior for your child, it will be easier for her to mimic these behaviors over time. Make it a point to greet those you encounter together on a daily basis, and engage in small talk wherever possible. Role play. Another great way to teach social skills to kids with autism is to role play. You can come up with fictional situations to act out together, or you can re-enact scenes that already happened and discuss more appropriate ways to handle such interactions in the future. Remember to practice often and to be consistent to ensure the principals and ideas you are trying to teach your child resonate with her. Use social stories and scripts. Social stories are written descriptions of everyday situations and events told from a child’s perspective. They are aimed at providing children with something to rehearse so they feel prepared once the situation described actually takes place, and can be an excellent strategy for teaching social skills to kids with autism. Social scripts are a little more generic in that they provide kids with a pre-defined list of things to say in certain situations, and while they are certainly useful in teaching kids how to start conversations and how to respond to small talk, they should be used with caution as they won’t work in every situation and can make kids sound too scripted. Develop a list of social rules. If your child struggles to understand some of the nuances of socialization, like the importance of saying ‘hello’ and ‘goodbye’, taking turns while talking, respecting personal space, etc., consider developing a list of ‘Social Rules’ for your child to abide by. Write them down on a white board and keep them somewhere visible so your child can refer to the list often, and if your child struggles to maintain the rules you’ve set forth, consider turning this into a reward system whereby your child earns a small treat for following a certain number of the rules you’ve set forth for her each day. Enroll your child in social groups. Many major cities offer social groups for kids with autism, which are aimed at pairing children with similar abilities together in an effort to provide opportunities for them to practice important social skills like starting conversations and taking turns talking. This is often done through play, and while social groups can be highly beneficial, the uniqueness of autism can make it difficult to find other kids with similar social skills to your child. Organize supervised playdates. If you’re interested in providing your child opportunities to socialize with her peers, but struggle to find kids with similar social abilities, consider hosting playdates with some of her school mates at your home and find ways to get involved so as to teach your child how to interact appropriately. Organize games and activities for the kids to enjoy during the playdate so your involvement seems natural, and find subtle ways to prompt your child. Alternatively, if the other parents are open to it, you might consider having one of your child’s therapists participate in the playdate so he/she can more appropriately teach your child what is expected of her. Read books. There are heaps of great books filled with social learning tips and social skills activities for kids with autism, many of which are geared towards providing ideas to parents and caregivers. Here are of 6 my favorites! The Zones of Regulation. The Zones of Regulation is a cognitive behavior based curriculum designed to help children learn how to regulate their emotions independently by teaching them how to identify their feelings and how their behavior impacts those around them. Developed by Leah M. Kuypers, the program teaches children how to recognize when they are in different emotional states called ‘zones’, which are represented by different colors. The Zones of Regulation uses activities to equip children with the tools they need to regulate their actions and stay in one zone (or move from one zone to another), allowing them increased control and problem-solving abilities, which will in turn help them understand how to interact in social settings, and how their actions may be perceived by and impact others. If your child struggles with self-control and lacks the ability to understand her emotions as well as the feelings of others, I highly recommend the program, and this book is a great starting point. You Are a Social Detective. This is an introductory book to the Social Thinking curriculum, and kids love it! Through fun cartoons, kids learn to distinguish between ‘expected’ and ‘unexpected’ social behaviors, and as they work through the book with a parent, therapist, or teacher, they will learn other ‘social smarts’, which will help them understand how they should and shouldn’t behave in social settings. The New Social Story Book. If you’re interested in using social stories to teach your children social skills and/or need inspiration on how to create your own social stories, this book is a great place to start. With over 150 social stores to choose from, these stories will help you teach your child how to recognize and respond to social cues, and how to make and maintain friendships. Social Skills Handbook for Autism: Activities to Help Kids Learn Social Skills and Make Friends. With more than 50 meaningful social skills activities to choose from, this book is packed with ideas to help parents, therapists, and teachers teach social skills to kids with autism. How to Make & Keep Friends: Tips for Kids to Overcome 50 Common Social Challenges. This book comes highly recommended from parents with older kids on the autism spectrum who struggle to make and maintain friendships. The Autism Activities Handbook: Activities to Help Kids Communicate, Make Friends, and Learn Life Skills. With more than 30 games and activities to help children on the spectrum learn different developmental skills like following directions, interacting with peers, developing social skills, and improving their communication and language skills, I highly recommend this book! And now for the fun part! If you’re looking for social skills activities for kids with autism and other developmental delays, this collection of 18 ideas is perfect for home, school, therapy, and social group settings, and double as fabulous one-on-one activities you can enjoy with your child when you want to spend some good ‘ole quality time together. If your kids enjoy the classic game Twister, this is a great Zones of Regulation activity, and you can set this up so many different ways. For example, when your child puts a hand on a certain color, he must tell you about a time he was in that colored zone, and when he puts his foot on a certain color, he must tell you about a strategy he used while in that colored zone to help him get back to the green zone. I remember this being a favorite birthday party game when I was growing up, and recently learned it’s a fabulous game to teach kids the art of self-control. All you have to do is pump some good tunes, let your child dance off some energy, and periodically stop the music and yell ‘FREEZE!’ The idea is for your child to go from dancing to standing completely still in an instant, which isn’t an easy task for kids who struggle with self-control. This set contains six unique board games in one box, which are focused on helping kids learn about morals, manners, empathy, friendship, and emotions. It’s a great bundle to consider and the games are perfect for family game night! The activities in this set help kids identify the size of their problems and the feelings they create, identify which reactions are/are not appropriate, and strategize possible solutions, making it a great way to engage in meaningful back-and-forth communication with your child while simultaneously teaching appropriate communication skills and responses. This is a fun classroom activity, but you can easily use it at home or in a therapy setting as well. The idea is to provide your child(ren) with a social challenge each day, and then have them reflect on how they felt while completing each activity. It’s an innovative way to get kids thinking about appropriate socialization throughout the day, and by offering your child a way to reflect on their feelings afterward, you will gain a greater understanding of how she perceives certain social settings and interactions. Scrabble is a great game for kids who struggle with planning and organization. As the game progresses, they must strategize and anticipate how they can build their own words off of those already played by others. This is also a great game for kids who struggle with spelling and/or vocabulary, and it gets them talking! Mosswood Connections is one of my favorite resources for ideas to help kids with developmental delays like autism and sensory processing disorder, and I recently found this Problems in a Jar activity on their site. It’s designed to help kids with executive function disorder learn how to define a problem, generate possible solutions, evaluate and select the best solution, and then implement the solution independently. 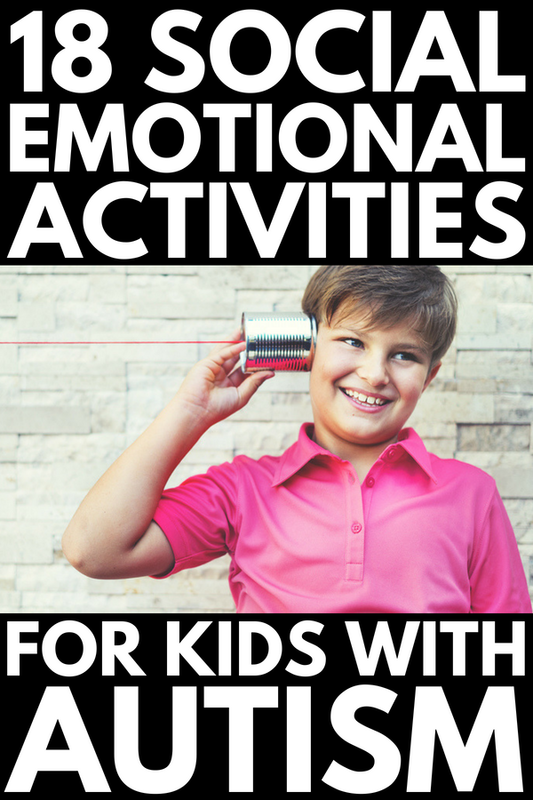 It’s a great social skills activity to work through with your child at home. Another great way to help a child develop her social skills is to sign her up for team sports she enjoys, like soccer or basketball. Organized activities such as these require kids to practice a whole range of social and problem-solving skills, like following directions, planning, strategizing, and even controlling their emotions in the event that they lose a game. I’m new to this game, but so far I really like it. To play, you lay out your cards and then try to find as many matches as possible. The cards are transparent and have different colored hoops on them in different positions. Players must look for matches (aka ‘swishes’), and the player to find the most wins. Swishes are created when a player can line up 2 cards such that the hoops are identical when they are stacked one on top of another. Cards can be rotated in order to make a swish, requiring players to use a variety of executive functions. In addition to exercising their visual-spatial abilities, they must focus and concentrate, and work quickly to beat their opponent, making it a great interactive game for kids who struggle with socialization. I hope this collection of teaching tips and social skills activities for kids with autism proves helpful to you. Remember to be a good role model, to practice patience and consistency, and to keep things FUN! If you liked this collection of teaching tips and social skills activities for kids with autism, please share this post on Pinterest! And if you’re looking for more autism-related tips and tricks, please follow our Autism board where we share all kinds of helpful ideas we find each day!